It's springtime in Vermont, a time when a young man's or young woman's fancy turns to -- to youth? Well, why not? After all, spring is all about renewal, rebirth, and regeneration, or so says a line in a popular Hallmark greeting card. It would seem, however, that no one in the Vermont Contemporary Music Ensemble's Department of Programming got the memo because the median age of the composers on today's menu is seventy-seven and a half. That’s a lot of Social Security kickbacks, AARP memberships, and denture adhesives. Whatever happened to the old adage, "Live fast, die young?" Henry Purcell sure practiced it. He kicked the bucket when he was only 36. Mozart was 35 and Gershwin was 38 when they bought their one-way tickets to Oblivion. The curtain abruptly fell on Bizet when he was 37. Both Chopin and von Weber had barely grazed the 39-year mark when their final chords sounded. Franz Schubert left at least one symphony unfinished at the age of 31. And Pergolesi --the composer, not the venerated pergola inventor -- checked out before he could see 27 candles embellish his tubercular birthday cake. At the opposite end of the spectrum is a veritable parade of geezers who have contributed to tonight's concert fare. Leading the pack is Elliott Carter, half a year shy of his 102nd birthday. Registering a mere 61 on the antique-o-meter is Dennis Báthory-Kitsz, the group's relative crumbsnatcher. So it would seem that these two plus the pair of hardy septuagenarians whose tunes make up the rest of the program prefer the "Stayin' Alive" philosophy. And why not? 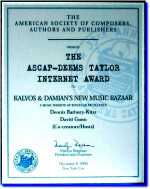 These days, the longer a composer can treat his audients to so-called acoustical events, the longer she can collect imaginary royalties from ASCAP or BMI or Goldman Sachs or any of a hundred other organizations that were created to, among other things, disregard a tunesmith's pecuniary needs. Which is a shame, really, because these days, most composers do need their pecuniaries. Speaking of longevity, which I was about to do, the combined age of tonight's four composers is 310 -- coincidentally the year that the Romans under Constantine defeated the Franks. Attentive listeners will hear more than one allusion to that blood-spattered battle at various times during the musical siege that will soon follow. And if the more bellicose among you feel compelled to join in the tumult, the management of this establishment implores you to temper that urge till the post-concert reception, where a good, clean food fight is always welcome. Likewise welcome is tonight's first contestant, who we will introduce as soon as we present our own credentials: Kalvos and Damian, at least one of whom has a tune on the concert that anagrammatizes into "Acme Termite Wad." And what are we supposed to take away from that? Maybe we'll find out later. Meantime, it's time for us to retreat to the semi-obscurity of the side of the stage, an area that we euphemistically call In the House -- near enough to the action to call the play by play if need be, but far enough away to not suffer the slings and arrows of outrageous fortissimos.